It’s been a good year for Johnson who was also named the world´s highest paid film star by Forbes magazine. He’s been named “sexiest man alive” and “world´s highest paid film star” — now Dwayne Johnson will be adding a Walk of Fame star to his list of accomplishments. 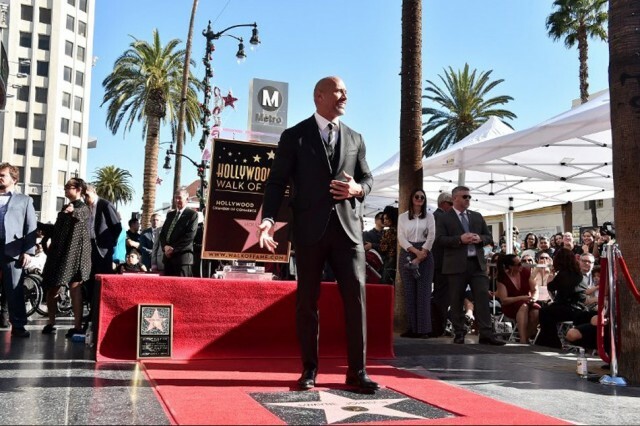 The 45-year old wrestling pro turned actor was joined by longtime partner Lauren Hashian and daughter Jasmine at the ceremony on Hollywood Boulevard. “I didn´t want to write anything down. I figured this is such a monumental moment and significant time for me it´s probably best I just speak from the heart and from my gut,” Johnson said. He told cheering fans the 2,624th star on the Walk was the result of years of hard work, voicing gratitude for the opportunities he´d been afforded and the friends and family who´d helped him along the way. “This moment is so significant because it´s full circle. 2018 will mark 18 years in Hollywood and that is a very long time of blood, sweat and earning respect,” he added. Tom Rothman, chairman of Sony Pictures Motion Picture Group, paid tribute to the actor, who has entertained the possibility that he might run for president in 2020. Born on May 2, 1972, in the San Francisco Bay Area and raised in Hawaii and Pennsylvania, Johnson grew to six foot five inches (196 centimeters) and weighs 245 pounds (111 kilograms). He played defensive tackle at the University of Miami and went on to a stint on the practice roster of the Calgary Stampeders of the Canadian Football League in 1995. Nicknamed “The Rock” due to his strength in the ring and roughhewn features, he was declared “sexiest man alive” by People magazine in November 2016.